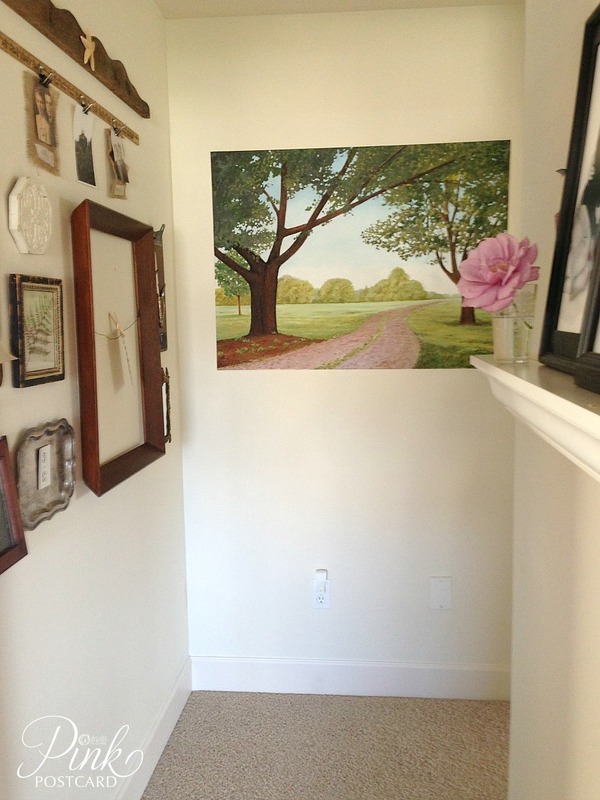 Last week I started another one of my 2013 projects- our upstairs hallway. Since we've been here 5 years, I thought it might be good to move on from the random framed artwork, and put up a few more family photos and meaningful pieces to us. With a little vintage flair. I got a ton of inspiration from Pinterest, and if you look at my hallway ideas board, you might see some similar looks that I borrowed from there. First and foremost, you need to know that I had a private little celebration in my hallway last Thursday. The gold / beige paint that once was THE interior color of our home, is gone. 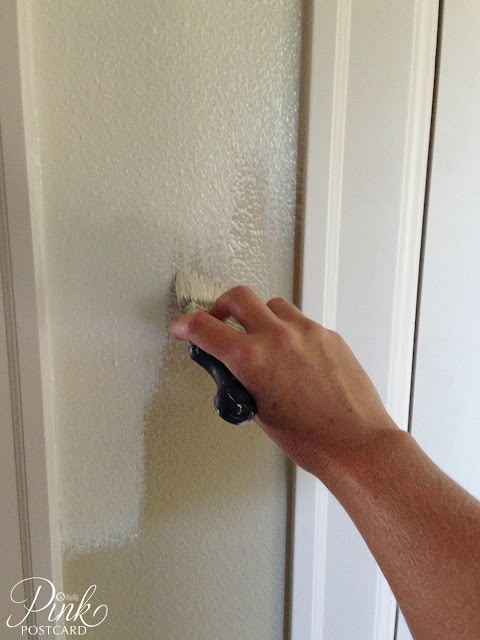 Completely gone- thanks to this project- which was the last space to have this color. 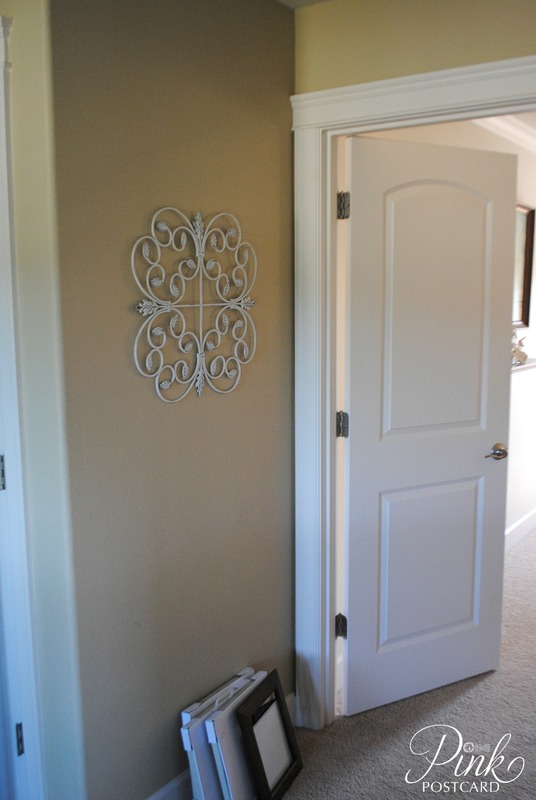 My new favorite, which I have used in our laundry room makeover, and our master bedroom / bath: Navajo White. 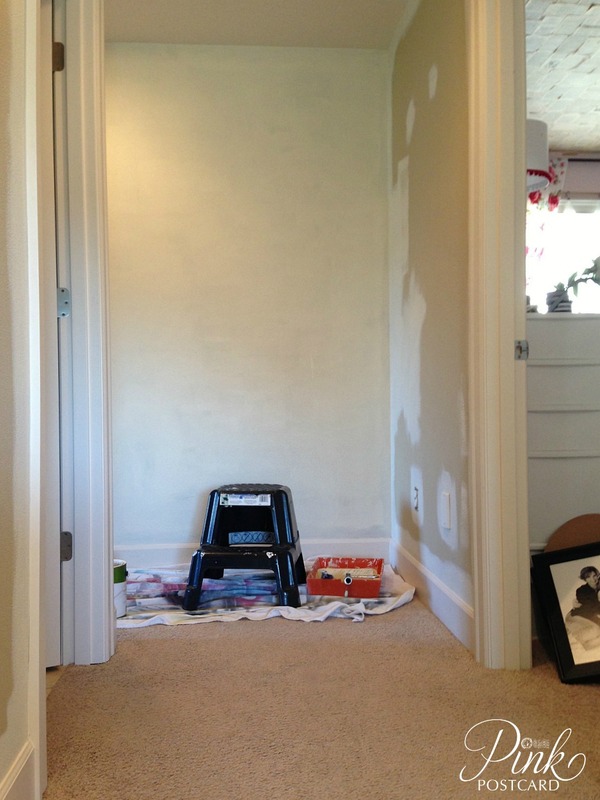 It's a Benjamin Moore color, but I always have it mixed in Home Depot's Behr. Such an amazing difference in the brightness up there! That was always my dislike with the beige- since our house is an East / West facing home, there were always interesting shades that would come through based on the season and time of day. And in the winter the beige turned very heavy and dark. Anyway, the new creamy shade sets off the details that I really wanted to highlight. I collected a couple vintage clipboards to use as frames. I think it's a whole lot more interesting and a whole lot cheaper than a frame. 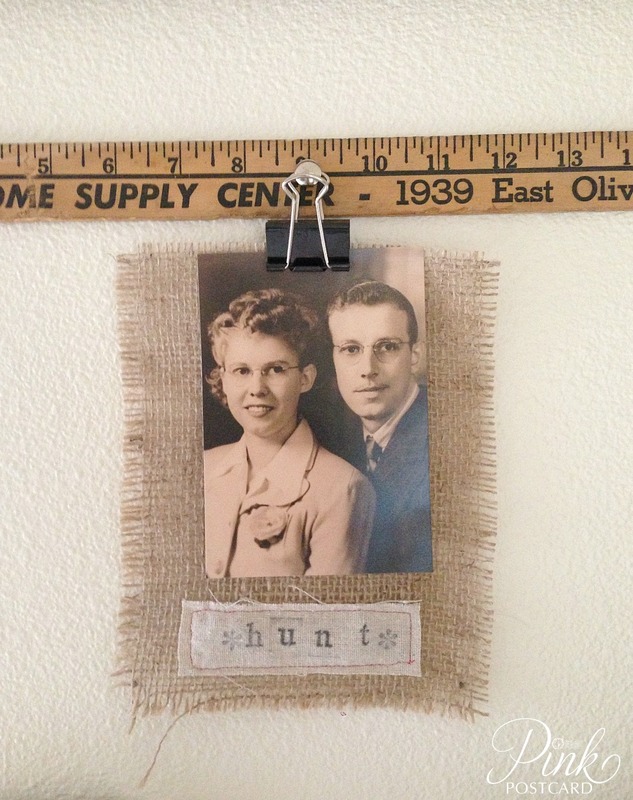 I also added in a vintage ledger paper as a backdrop for the photo. I have a stack of them that were given to me by my friend, Martha. I saw this idea on Pinterest- it was actually a photo from a shop that was displaying all of their silverware that they were selling. 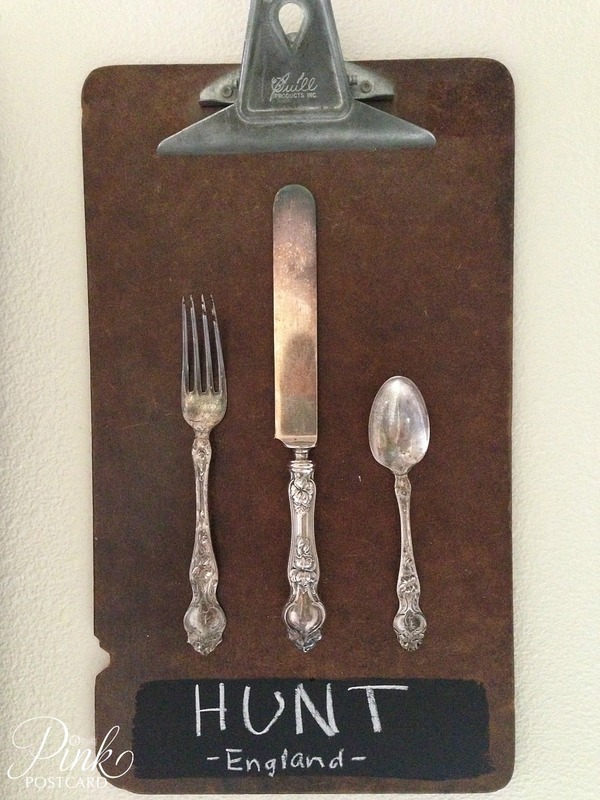 I had a set of my great grandmother's silver that she brought over from England, and thought it would be fun to display it on another clipboard. 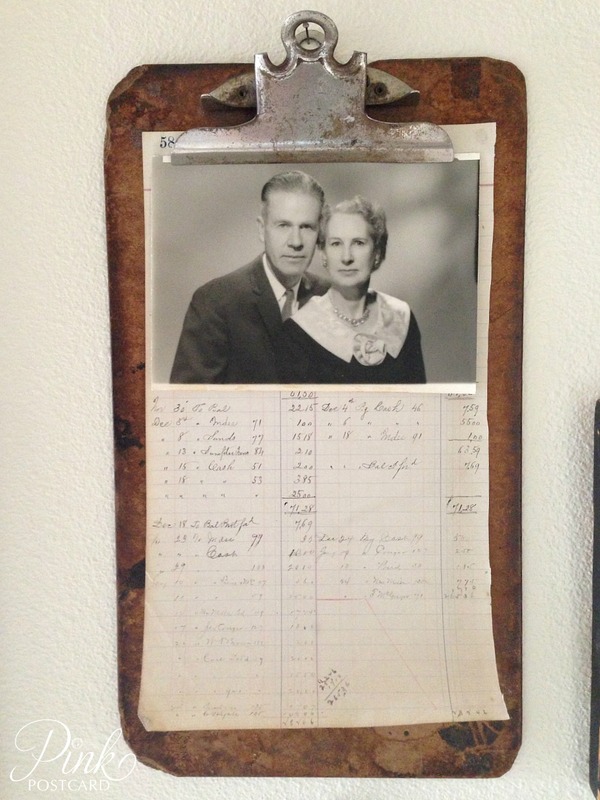 This is a photo of my grandparents. I think it's their engagement picture. I hung a yardstick on the wall, added some upholstery tacks and hung the photo with a binder clip. A square of tattered burlap for a "frame" and I did a quick stitch with red thread with their last name under the photo. I also added a few elements of interest to the gallery wall- a chippy vintage frame (also from Goodwill at 99 cents) with some more ledger paper and a fern frond from our garden. 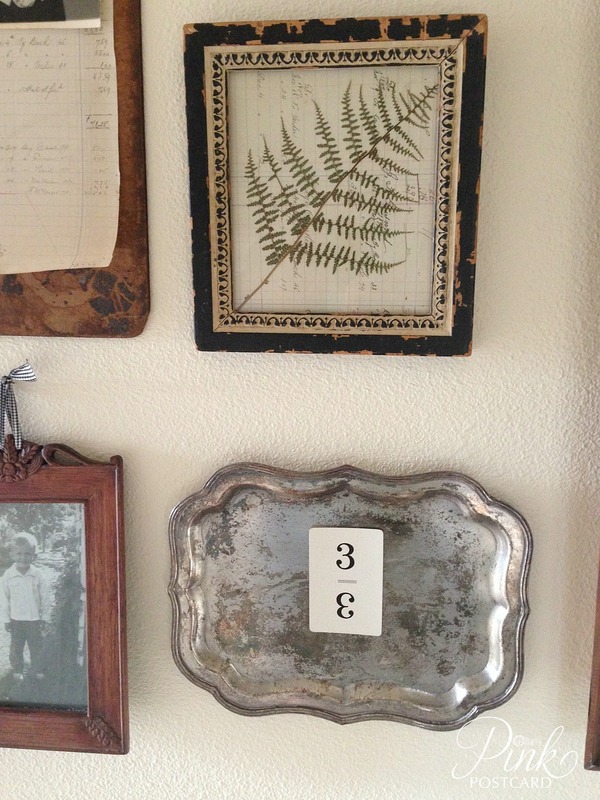 The silver tray had an interesting shape, and I added in the 1920's Flinch game card with the Number 3. 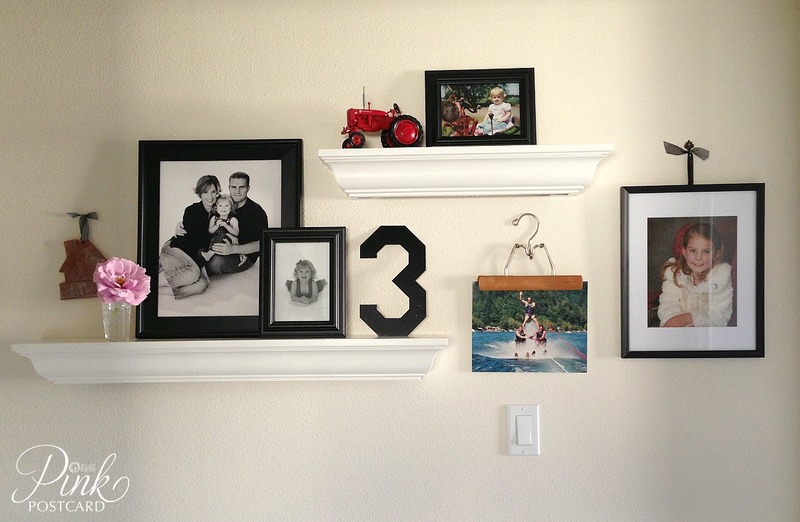 We have lots of 3's going on around the house. It's a celebration of what we are as a family. After our struggle with infertility and the heartbreak of a dream, I decided instead to celebrate what we have! 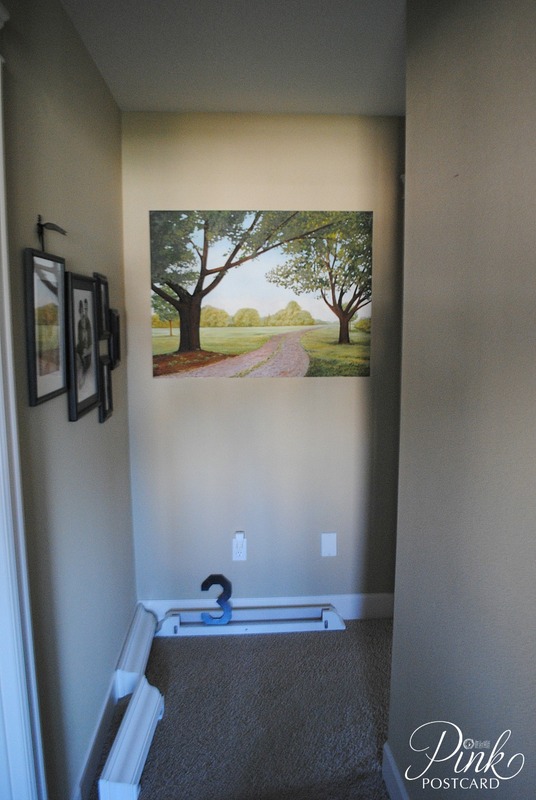 Also, the painting my dad did for us- the one that was above our mantel until a recent switcheroo- is now in our hallway. We see it everyday, and I love having it here. This next section of wall is mostly us. There's still plenty of room in the new gallery for more photos. Hannah made the little clay house with our name on it in first grade. I've been wanting to hang it up in a special spot, and it finally has a great home. 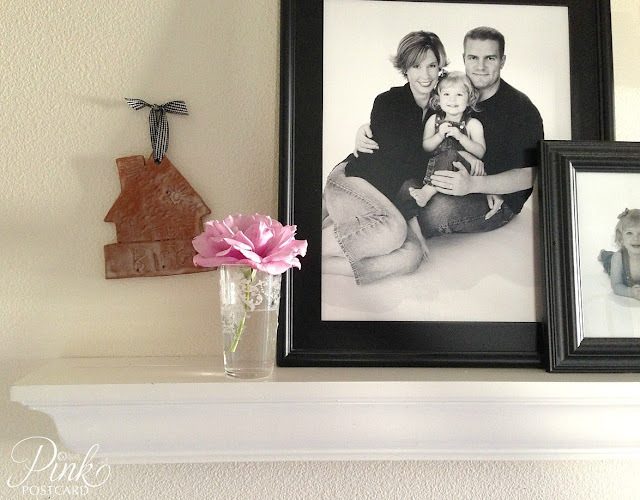 I also like to put flowers around the house in unexpected places. 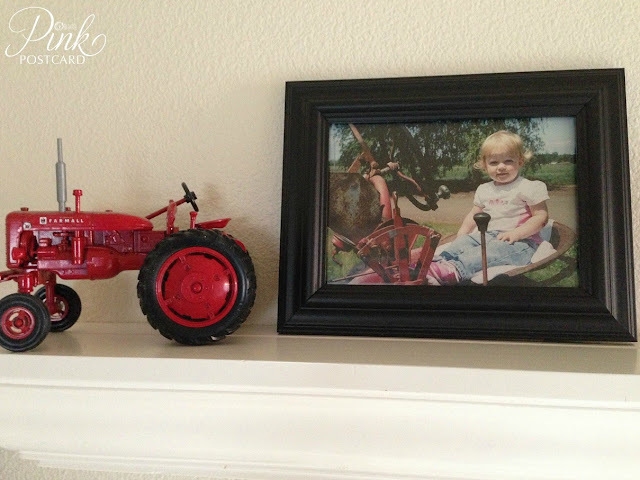 Jon's parents took this picture of Hannah on their tractor when she was about a year and a half. Jon's dad passed away last fall, and his dad had collected a few toy tractors for the grandkids. We recently were given this one, and I love that it is the same one that Hannah is sitting on in the photo. 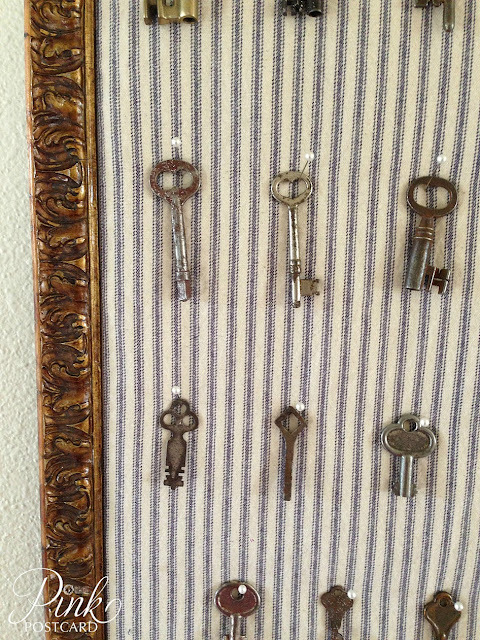 Next to our bedroom, I made this display for some vintage skeleton keys that my mom passed on to me. She collected them for a time, and now they are mine! 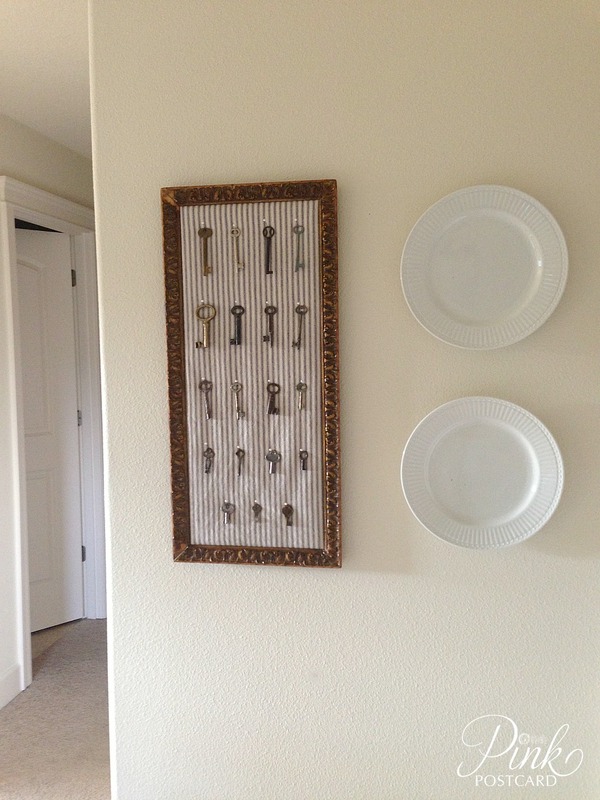 The plates are a temporary addition until I can add some more photos here. So there you have it- our new, vintage inspired gallery hallway. I'm still waiting on some more family photos from Jon's side, but like I said, I left room for more additions now and in the future. I'll share how I put some of these details together soon! 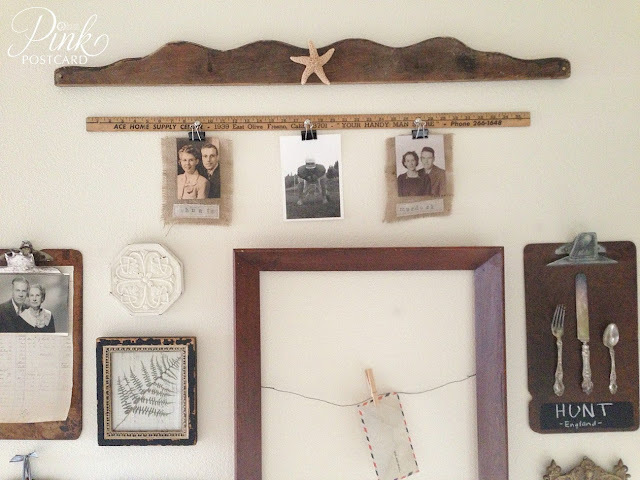 I hope this gives you some fresh ideas on inexpensive and creative ways to share your family photos and history. So what's the last item on our 2013 to do list? Can't wait to get that project started! perfect! 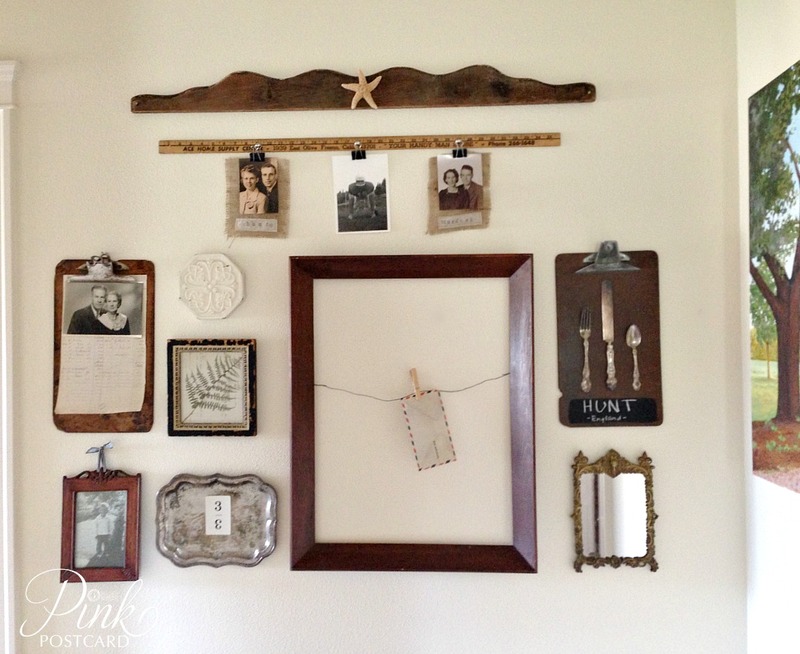 love all the creative ways you hung things! 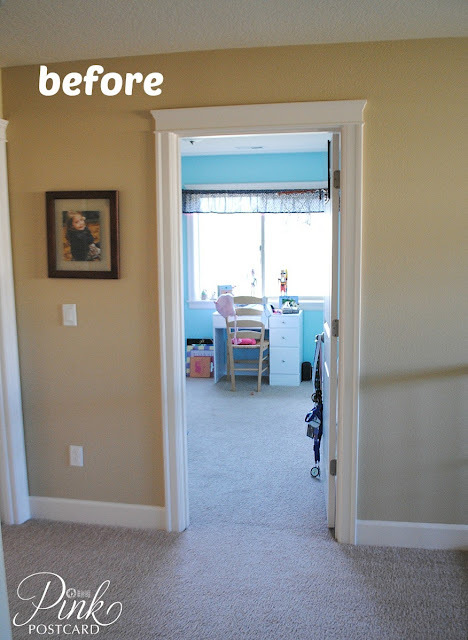 So many, many great decor ideas in this one hallway! I'm lovin it! This is art! I'm so impressed and inspired by your walls! Thanks for sharing this with us! I plan to copy shamelessly! Pinned as Blue Strong and I'm off to the Thrift Store! 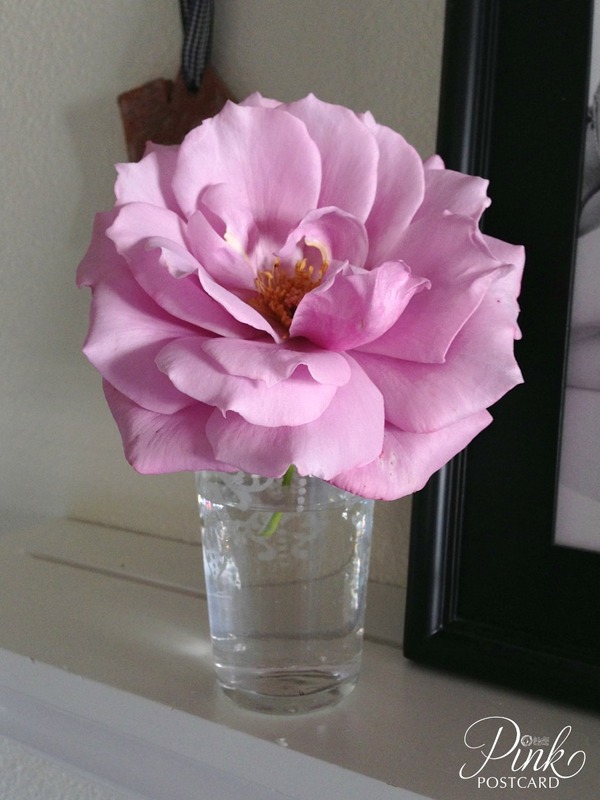 Beautifully done Denise! I love that your collections not only look interesting, but that they have special meaning too! And really, isn't that what it's all about!